Howdie sweet people. Welcome to the final stretch of my Christmas decorations series. My house is beginning to look so good, I love seeing all my projects around me. Todays project involves lots of Christmas fairy lights. Love me some lights! But if you have been here before you might know that already. Yep you have found it. I have the honor of doing another giveaway for you. You’ll have to scroll down for the details. I was putting the final touches of the living room this weekend. Putting the tree up, getting rid of the clutter, and hanging some last minute decorations, all in preparation for my Home Tour post on Friday. I moved my teacup candle holders to a new spot. Which left me with an empty little side table. And we can’t have that, now can we. New, last minute little vignette. So simple. I just shopped the house. The lantern from outside got a little spray snow treatment (mostly to disguise the fact that the glass is pretty stained) and I stuffed the lights back inside that have been living there for years now. I stole the mirror from the hallway. I plunked down some more little Christmas trees and ornaments. And if finished it off with three little white lanterns I found at Ikea this year. Really it was so fast and easy, that I feel almost embarrassed to show you. 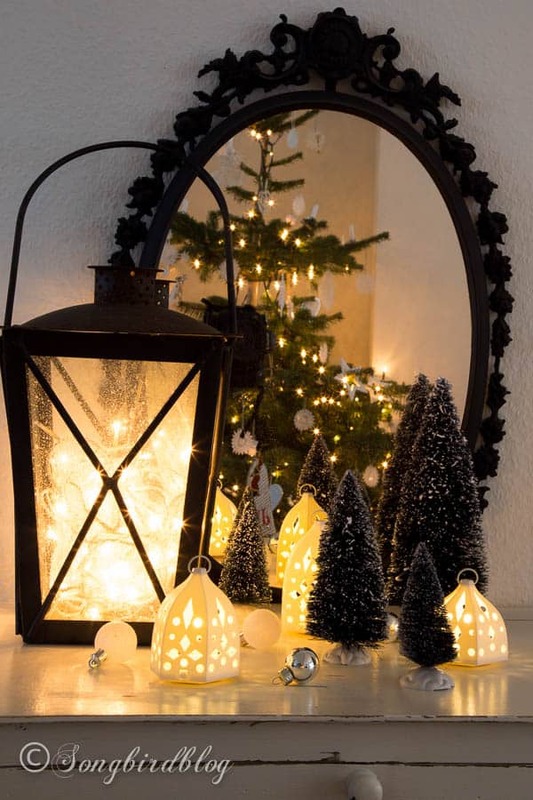 But maybe it will inspire you to stuff a mirror in the edge behind a cupboard, put some fairy lights in a glass container and scatter some decorations around. There is no science to decorating. Just do what makes you happy. These little Christmas fairy lights makes me happy. Especially at night, when the lights of the tree are reflected in the mirror and those little lanterns scattered among the trees look like magical little houses with fairies inside. It is truly a fairy lights vignette. Did I already have a true bokeh shot this series? No well this is it . Because I love you all so much. And I really want to give back to you, I am offering this giveaway from me to you. For anyone who wants to enter there is a $ 150 Amazon Gift Certificate for grabs. All you have to do is leave me a comment, telling me that you would like a chance to win. Nothing else is needed. Just one comment. All of these are totally optional, I will love you for it, but this giveaway is a one step affair. I just ask you to use an email address that you actually read, so I can find you if you are the winner. What is left in this series? One little but fun project tomorrow. My home tour (with unpublished pics from my living room) on Friday. And on Saturday you all can link up at all our Linky Parties. We will be heavily sharing our favorites all weekend on FB and Pinterest. So make sure you link up an appropriate project at the different link parties. I love your decorating skills! They are simple but elegant! So glad I found your site! I have been looking for a clock for my craft room/ office and that is what I would use the Amazon gidpft card on if I would win, so pleeeeeeze! Please enter me in your giveaway. I just love your decorating style. I love the lantern and the little white ones too. So pretty. Where did you get the mirror. Loving that. Would love to be entered in the contest too. Thank you. Great idea to set a mirror to reflect your dear little fairy lights! Love the simplicity of white lights – especially when reflected in a mirror. Just beautiful! So cute! And I love amazon! I love the fairy lights post. To me it’s all about the trees and white lights…my favorites at Christmas! I’m so glad I found your blog. I love fairy lights, and I could see doing a similar little vignette after the holidays are over, just to keep the sparkle going. It’s always a little sad for me to take down the lights in January. And I’d love to enter your giveaway too! That is so lovely, I adore the little white lanterns! I would love to win this because I just found out yesterday that I will be spending Christmas alone, and I am having a pity party for myself, lol. LOVE that lantern! Hi Karen, I saw your post as I was scrolling by to leave my own comment, and I just had to stop. I’m sorry! I just wanted to encourage you to reach out to a single friend–or maybe find some way that you could give of yourself–like maybe serving at a ‘soup kitchen’ or homeless shelter, or visiting an old folk’s home and “adopting” someone who doesn’t get many visitors. That could bring you lots of joy–and I do wish you a joy-filled day as we remember the true meaning of Christmas, which is the gift God gave us of His Son who would die for our redemption. I’m sorry, I don’t mean to be “preachy” but I wanted to encourage you. Oooo, I love the lights. I have a couple of lanterns that are just screaming for some. Would love to be entered into the contest. Thank you! I just love your blog. I get so excited when I get an email announcing a new post. Thank you so much for a chance to win such a great prize. Happy Holidays! Love to enter your giveaway!!! 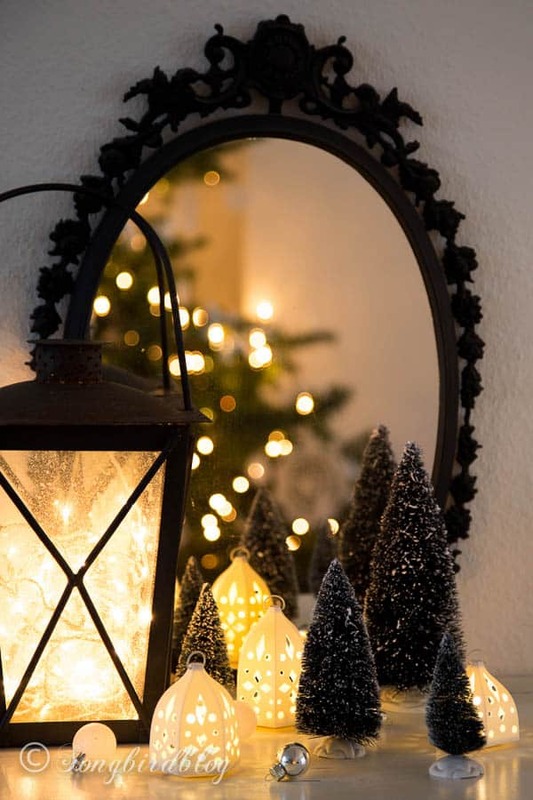 Also love your use of black in your pretty fairy light vignette! Holy Smokes … I would LOVE to win this giveaway. I’d rather it be an airline ticket so that I could visit your home. Everything is so beautiful and festive … and PERFECT. Thank you for the tea light viewing – bet it’s much prettier in person. Do you maybe want to reconsider switching up the giveaway to a ticket? Hi Marianne, only just found you thru Donna at Funky Junk, and already love your style. Have subscribed to FB, Pinterest and Instagram. I’s love to be in the running to win the gift certificate. That’s wonderfully generous of you. I would love to win this giveaway. Thank you so much for offering up these Christmas plans and giveaways on your site, and your fellow bloggers who are doing the same. I’ve enjoyed your series, especially the Window Sill Decorations! Please enter me in your contest, and thank you! I like that depending on what you put with the lantern, you wouldn’t have to take it completely down in January! I would love to win the Amazon gift certificate to get gifts for family and friends I might not otherwise be able to do. I love the Fairy Lights… Thanks for the chance to win a gift card! HI Marianne, How sweet you are to offer one of us a gift card! Thank you for your beautiful blog, which I think of as a gift almost every time I read it. Your home is lovely. Have a wonderful Christmas! Marianne – I would love a chance to win the Amazon gift card. It would be so helpful with Christmas shopping. I adore your beautiful blog. I tune in first thing in the morning and it brightens my day! Have a Blessed Christmas season! You have a beautiful house. I would love to win the gift card and give it to my daughter for her new baby. Thanks. I would love to give this to my son so he could pick out something he would really like for Christmas. Thank you! Wonderful Blog…love your style. Your Christmas series has certainly been inspiring. Thank you for the opportunity to win a “gift”. I have enjoyed following you for quite a while now and would love to get the Amazon card to buy some goodies for my vignettes! Happy Holidays! I’d love to win the giftcard! I would love to win the gift certificate to Amazon. Merry Christmas. The items I purchase the most from Amazon are tea from England, and books. Ooooo! I want to win! That would just be amazing! Thank you, Marianne, for your generosity to us in offering this gift card, and for sharing all of your lovely Christmas decorations. I love your lantern fairy lights so beautiful! What a great idea to add the mirror for reflecting it back. I would love to win. I would love to win! What a fabulous Christmas gift that would be! Your decor is beautiful. Merry Christmas! It would be so fun to win! I’m loving all your Christmas ideas. You and the Mr. have a wonderful Christmas. Just love your blog!! So glad I found you!! You have fantastic style!! I’ll be back a lot!!! Thank you for so generously sharing your talents and ideas with us all. Merry Christmas. Love your blog! Thanks for such a great giveaway! Count me in! Love this idea and I have all the ingredients plus a bare dresser in my guest room that needs a little something! So many things I could do with an Amazon gift card. Love your simple and beautiful decorating ideas. Amazon gift card would be a great prize to win!! Love your blog! Have a Merry Christmas! Of course I would love to win, but I’m just happy to have found your blog. Gotta love fairy lights and upside-down tea cups! Nice to meet you! Thanks for a chance to win! Such a cute display and I love those little lights too! I am really enjoying your blog, just found it this week through Funky Junk.Would love to win the gift card. I left a comment yesterday and can’t believe I forgot to say thanks for the opportunity to win this fabulous prize! I would love an Amazon gift card!! Love Amazon and would love to win a gift card. Thanks! Your decor is so inspiring! Thanks for all the share! I love your display. I just ordered some fairy lights. I would love to win the Amazon gift card. I love your blog…..you have such a gift! I love your blog (I’m a subscriber) & I’d love a chance to win your awesome Amazon giveaway! I absolutely love your blog and read it faithfully. I adore your magical decorating sense. I must order some Fairy lights or my life will not be complete. Thank you for your beautiful blog. Thank you also for the opportunity to enter for a chance to win the gift card for Amazon, that would be awesome for some little treasures for me and my honey after the holidays. We try to put forth our best to make the holidays magical for the grandkids, we have each other and that makes us happy. I would so like a chance to win any of your giveaways. Thank you for sharing your beautiful home and talents with us. Merry Christmas. Love your Christmas decorating, especially the fairy lights. The Amazon gift card would be wonderful. Merry Christmas to you! Als het nog kan, doe ik graag mee! Ik koop regelmatig iets Amazon, voornamelijk boeken. De kaart zou dus heel erg welkom zijn. Marianne, Found your site through the Christmas Holiday Home Tour. Love your blog. Would love the Amazon gift card. Look forward to reading your blog in 2015. Merry Christmas! I would love to be entered into the Amazon giveaway, and I’m looking forward to more beautiful blog posts in the near future! your home is beautiful!! Would love an amazon gift card!! Happy holidays! Nice home tour! How sweet of you to have a giveaway! Nice!!! Really saw a lot I would like to do too! Thank you for taking the time to post your lovely pictures. I’m not sure I’m probably late but oh it would be a treat to win an Amazon card!! Love your blog! Would love some extra spending money at Amazon! I would love to win this gift card…not for me, for my son! He’s so hard to buy for and orders practically everything (even toilet paper) from Amazon. Thanks for the giveaway! I would be so excited to win an Amazon card. There is ALWAYS something there to be purchased. Happy Holidays to you & yours. Thanks for sharing your home and decorating ideas, and for the chance to win an Amazon gift card. Would put it to good use. Would love to shop Amazon! Love your decorating, so creative! I would love to win a gift card to help buy my five precious grandchildren gifts. I’m eyeballing some comforter sets to go on my new (built by me!) bedframe and headboard. I would love to win an amazon gift card to fund that! I am so thankful for these link ups because I get to find new and wonderful blogs to follow. This time I’ve found yours and I am delighted to now follow. What a lovely home. If I had the chance to win I think I would save the card for my sons birthday in Feb. Paying Christmas bills sometimes gets in the way of buying birthday presents and this year Christmas time dental bills aren’t adding any fun! So I would use the card for Amazon (because let’s face it, you can get anything on Amazon!) for my sons Groundhog day birthday. Thanks for the chance and for the daily gift of a new blog to look at. I’m a long-time subscriber & admirer, so I’ll just say: Thank you for hosting this (yet another) contest! Love your blog posts… and esp that quilt and bed in the heading pic! May you and all, have a wonderful Christmas season and fabulous New Year!!! and may those suffering/hurting find Him and joy! I love the little lanterns from Ikea. I may have to go visit that store. And it all comes together really beautifully! Does my excitement show ?? well I am soooo excited. an Amazon gift card; well yes please. I did not know this kind of thing happens online. I just signed up and would really love to win the gift card. I look forward to seeing your posts. Love your inspiration…thanks for a chance to win! I’m sure this giveaway is probably already done, but if not I’d love to enter. More so though I’d just like to let you know you inspire me with your beautiful, creative posts. How sweet of you to give one of your readers this wonderful gift card….please count me in. I would have a lot of fun shopping on-line. I love your blog and do hope that I still have a chance to go in the draw for the gift card. I’ve been following you for awhile and enjoy your posts. Thank you for the opportunity to win! Would love the chance to enter! Thanks for the opportunity this Christmas for a fun gift. I would love to win, would be great to use towards some décor for next year. Thanks for all your wonderful posts this year! Love your fairy light vignette! Plese enter me in your giveaway. Following you on Pinterest. Hello! I just found your site, and, I love your decorations! Would you please enter me into your contest? Thank you! Hello! I just found your site, and, I love your decorations! How sweet of you to have a contest! Would you please enter me into the contest? Thank you! I would like a chance to win your giveaway. I am loving your blog. I have so many ideas for crafts and projects to make now. I would love to win the Amazon card, too. Merry Christmas to you! Thanks for the giveaway and the chance to win! I love your fairy lights! Following all ways possible. Thanks for the chance at this lovely giveaway. We just put a bid on a house and I am praying it comes through. I would buy things for our new home. Merry Christmas. I’m reaching out from Country Living, where I work on food, lifestyle, and crafts for our daily website. We just wanted to let you know that we featured your Christmas Fairy Lights in a slideshow of our favorite ways to decorate with christmas lights. We spotlighted one image from your blog and, of course, linked back to your post for a full tutorial and more details. Thank you! I love to be featured by sites like yours.